HRX217VYA - the ultimate lawn mower in convenience and versatility. Easily adjust the mower's speed to your stride by rotating the speed adjust dial. Then engage the Select Drive control for intuitive, comfortable speed control. Variable speed from 0 to 4 mph. Honda's Roto-Stop blade stop system allows you to step away from the mower, without having to stop and restart the engine. Move items out of the way, empty the bag, or take a break, without having to restart your mower. Honda's revolutionary Versamow System allows you to mulch, bag, discharge, and shred leaves - or even a combination of mulching and bagging! Just slide the convenient Clip Director knob to choose how much grass is bagged or mulched. No tools or costly attachments are needed. 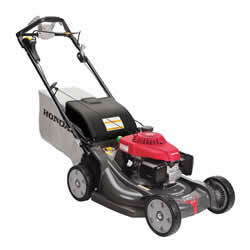 Honda's exclusive twin blade MicroCut System uses four cutting surfaces that result in ultra fine clippings for superior mulching and more clippings per bag. The end result? A perfect cut, less time emptying the bag, and less work for you.The HRX's 21" deck is made of NeXite. This high impact resistant material does not dent, rust, or corrode over time. So durable it comes with a lifetime warranty! Easy-starting, fuel efficient, and powerful, Honda's premium residential GCV190 engines are legendary for providing years of reliable service. All Honda lawn mower engines are certified to meet 50-state EPA and CARB emission levels. And last but not least, no engine choke required! Just start the mower and go! Mowing height range: 3/4" - 4"